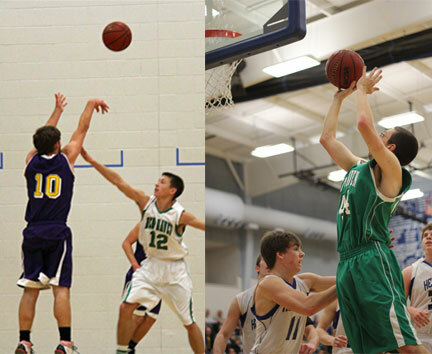 Pictured on left is Eli Strobel and right is Ben Luecke. The top award any student athlete could receive is not being named player of the year or voted to an All-State Team. While these are great individual achievements and deserve recognition, there is one award that is gone overlooked and rarely receives much attention. Unlike other all-state teams where athletes are selected solely on their ability to play basketball, Academic All-State has to be earned both on the court and in the classroom. Ruediger catches a pass in mid-air from Seth Schenck against Linn. New Haven, Mo. 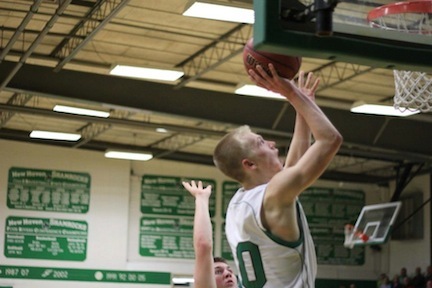 – Kyle Ruediger was one of two sophomores selected first team all conference despite playing well less than 100% throughout the majority of the season and missing three games after the South Callaway Tournament where he was voted tournament MVP. Seth Schenck was voted second team all conference, one of the New Haven’s top defenders and in charge of running the New Haven offense. Watch the final seconds of an unbelievable finish. Farmington, Mo. 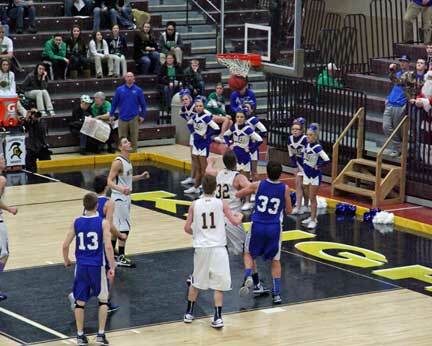 – Oran is headed to the boys Class 2 Final Four after defeating Winona 63-61. Winona had a chance at taking the lead with 33 seconds left, posting up their 6’8” senior Jeff Smith but his turn around jumper was long. Photo is a screen shot from the amazing video you have to watch to believe. --Imagine something you love, for me, it would be basketball. Growing up as a little kid all I could dream about was playing high school basketball and wearing the green and white jersey. Now imagine growing up as a kid and having the same dream of playing for your high school as I did, but not being able to live that dream. 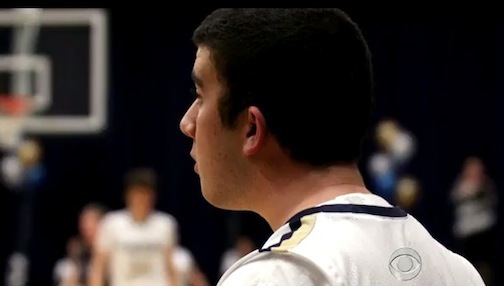 CBS’s Scott Pelley recently did a story about Coronado High School Thunderbirds’ team basketball manager Mitchel Marcus and what his coach did to make his dream come true. 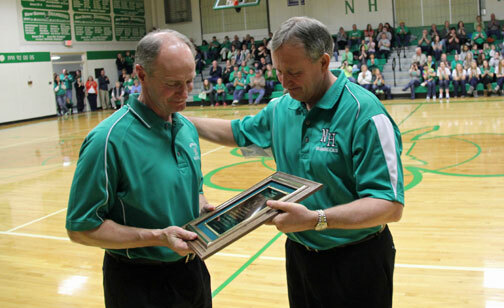 Coach Ray Steinhoff presents Coach Tim Strobel a plaque after he was recognized before Friday night's varsity game. New Haven, Mo. – There has always been the same voice heard through the speakers at New Haven High School during special events, for example when Ray Steinhoff was recognized for achieving his 500th win or in 2006 when they celebrated the 50th anniversary of New Haven’s first state championship and there has always been the same man behind the scenes that made events like these possible. Friday night the man who turned Dale Helling into “The Voice of New Haven” always recruiting him to read what was taking place had the tables turned on him. It was time to recognize and thank Mr. Tim Strobel for his 20 years of coaching. Senior Austin Madden walks off the Ray Steinhoff Court for the last time. New Haven, Mo. 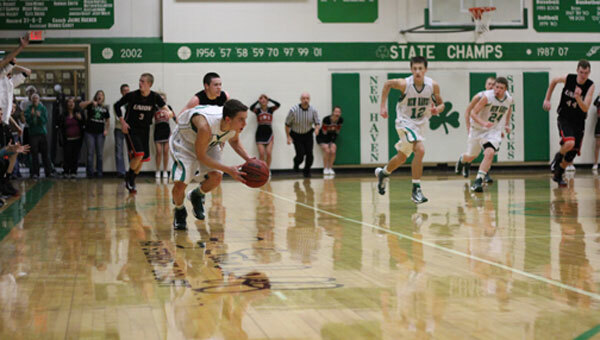 – The Shamrocks cruised past Owensville 45-22 in their final regular season game in front of a packed house. For the first time since suffering a high ankle sprain over a month ago Kyle Ruediger left little doubt whether or not he was playing a full strength, scoring a game high 17 points and eight rebounds in Friday night’s win. 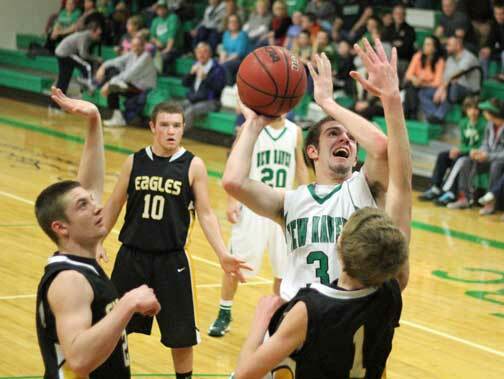 Austin Madden brings New Haven within three midway through the third quarter. Please Note: Important announcement at bottom of article. New Haven, Mo. 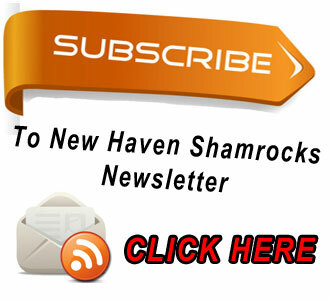 –Coming off an overtime win in Friday night’s conference battle with Union, it looked as if New Haven had overcome what had been a season of heartbreaking losses and unfortunate injuries; Shamrock fans caught a glimpse of sunlight at the Homecoming game. However, Tuesday night the clouds thickened, taking away the light from Friday night. Sullivan’s Justin Biermann led all scores with 19 points followed by J.C. Beckett’s 14 points, hitting three 3’s in the first half, leading Sullivan to a 41-29 win. 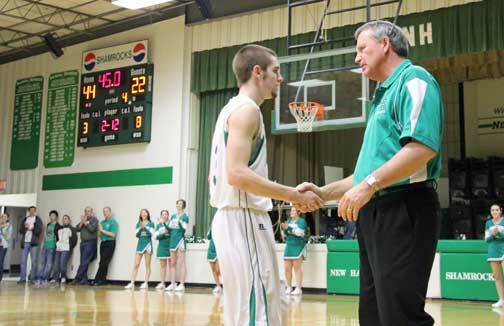 This improved Sullivan to 3-1, and 14-7 on the year, while New Haven fell to 1-3, 11-11. Ross Seitter picks up a loose ball in overtime as New Haven trails 48-47, to give the Shamrocks a one point lead with under a minute to play. New Haven, Mo. – Friday night’s overtime thriller saw a combined 13 lead changes, seven times the game was tied, and neither team able to build more than three point lead. Union trailed by two, 42-40, as Nick Ziegler drove to the basket, hitting a turn around jumper as time expired, forcing the overtime and giving Union the momentum. In the past two weeks New Haven has lost four games on the last possession and three of those times had control the last possession. “For regulation to end the way it did tonight…you could see it in the kid’s eyes…was like here we go again,” coach Ray Steinhoff told Quick News after the game. --We will have a complete game story of New Haven’s overtime win in Friday night’s Homecoming game against Union. It was an electrifying atmosphere as Union scored as time expired in regulation to force overtime. Watch how the final seconds of regulation and overtime unfolded in a great high school basketball game.